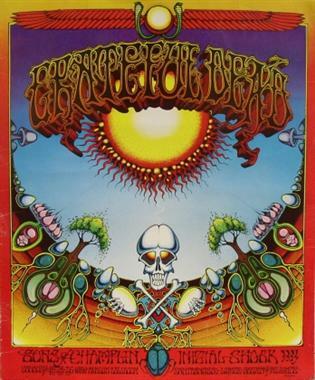 The vintage concert posters that were used to advertise Grateful Dead concerts are some of the finest examples of 60s psychedelic art. 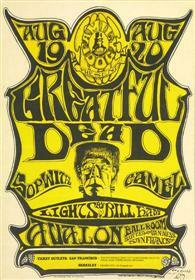 Rock concert posters as we know them today were born in San Francisco in the Sixties - one of the most fertile periods for art and culture in American history. 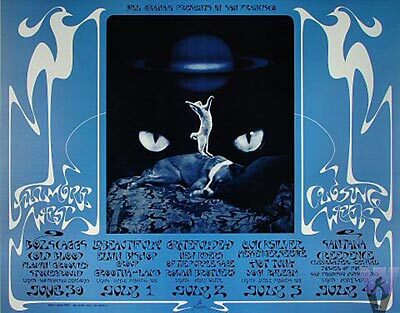 In 1966 the two biggest concert promoters - Chet Helms and Bill Graham - started producing these posters to advertise their concerts. The heavily LSD influenced psychedelic rock music that was being played at these shows inspired the artists to create equally wild images in their rock poster art. These psychedelic posters broke all the rules of advertising. The stylized lettering used was often completely illegible and required the viewer to really concentrate in order to read them at all. Clever designs and shockingly vivid colors were used to create optical illusions that drew you in and attempted to simulate the experience of an LSD trip. At first the artists and promoters didn't realize that they were creating revolutionary works of art, they just thought it was a cool way to get the word out about their concerts. But they soon realized that they were really on to something big. Bill Graham in particular started putting aside copies of each poster as soon as they came off the press. He realized that they were making history and knew that one day such a collection of vintage concert posters might become extremely valuable. 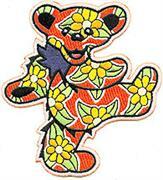 If you're interested in learning more about Bill Graham you should check out my article on streaming Grateful Dead music at Wolfgang's Vault. Original copies of vintage concert posters in mint condition are extremely rare because most of them were stapled to telephone poles or taped to store windows and then pulled down by fans after the show. Today these posters can be found in museums all over the world including the Louvre and the Smithsonian. They are collector's items which are sought after by many and command high prices just like famous paintings and other rare works of art. In the beginning the majority of these vintage concert posters were created by five artists, often referred to as the "San Francisco Five". They were Rick Griffin, Stanley Mouse, Alton Kelley, Wes Wilson and Victor Moscosco - the fathers of 60s psychedelic art. As larger numbers of posters were produced they were joined by many more incredible artists. No list of concert poster artists would be complete without Lee Conklin, Bob Masse, Bob Fried, Randy Tuten and David Singer - just to name a few. Some of these artists were responsible for just as many posters as any of the original five. The most famous vintage concert posters were produced as part of two major series - the Bill Graham numbered series and the Family Dog numbered series. These two series also contain posters advertising many of the most legendary performers ever to take the stage including Janis Joplin, Otis Redding, The Who, Jimi Hendrix, Jefferson Airplane and Led Zeppelin. 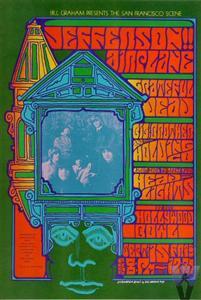 The Bill Graham series ran from 1966 to 1973 and contains nearly 300 posters. Because the posters were numbered and catalogued as they were being produced this series is extremely well documented. This is rare for a series of items which was never meant to be collected. It makes it much easier for collectors and historians to tell the differences between various printings and to identify fakes. The Family Dog series ran from 1966 to 1968 and contains 147 posters that were produced to publicize concerts held at the Avalon Ballroom. The series also contains many posters made for Family Dog events in other cities as well as for concerts that were put on after 1968 when they stopped numbering. Because of this the Family Dog posters are not nearly as well documented as the Bill Graham posters although they are just as important historically. They're somewhat more rare because they weren't as well preserved - making posters in good condition even more costly and collectible. Many other well known posters - such as the one from the Avalon by Rick Griffin shown at the top of this page - were produced outside of the numbered series. These have since been assigned numbers for identification purposes in "The Art Of Rock" - a fantastic book which is widely regarded as an authority on vintage concert posters. In addition to vintage concert posters both promoters also printed handbills, postcards and even tickets with the same designs. They would give out the handbills before the show and sometimes hand out posters as people were leaving. 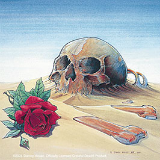 The bands were highly impressed with the posters and would often hire the artists to do more work for them such as album art. 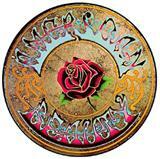 In particular, much of the Grateful Dead artwork that has come to be closely associated with the group was designed by Rick Griffin, Stanley Mouse and Alton Kelley. 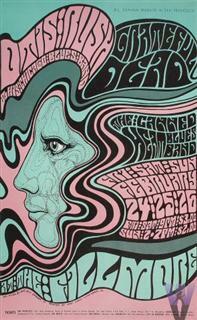 They were true pioneers of psychedelic art and they regularly broke new ground in the field of graphic design. 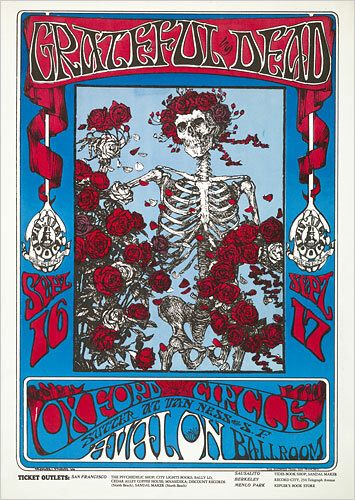 Probably the most famous Grateful Dead concert poster was the skull and roses poster (FD #26) created by Mouse and Kelley for the September 16-17 Avalon Ballroom shows in 1966. 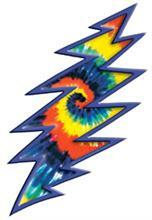 It started a long standing tradition of using skeletons, skulls and roses to symbolize the GD. I absolutely love this poster - the effect is stunning and I think its one of the most important works of art of the twentieth century. 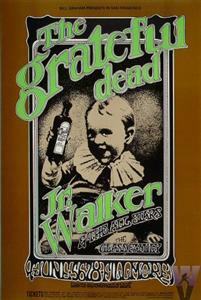 If you're interested in purchasing any of the Grateful Dead concert posters pictured here you can find them all at Wolfgang's Vault. I buy stuff there all the time and can wholeheartedly recommend them as one of my favorite places to shop for psychedelic art.